[S55] 1870 Census;, This couple is too old to have a year old child. Wonder where she came from. [S602] Unknown author, "unknown short title," e-mail to unknown recipient. [S619] Art Hall, "unknown short title," e-mail to MVW, April 20, 2009. [S620] Unknown author, "unknown short title," e-mail to unknown recipient, April 20, 2009. [S581] Genforum - Barefoot, Oct 7 1999. Death* 1798� He died in 1798 at Johnson, N.C, Ed Harmon said he lived and died in Sampson County NC - could be that the name changed. His will lists children, spouses and wife. [S49] 1820 Census;, Note for research. Do not rely on the ancestry.com index for this census. Better to go the rootsweb.com for pulaski County. 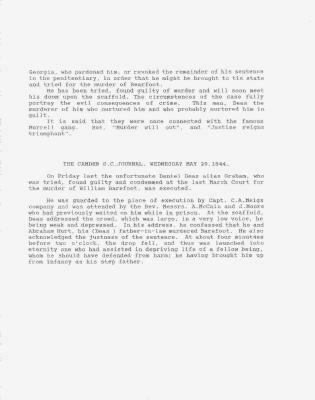 Ancestry misses several names and additionally does not take you to the proper page. See my census book for copies. I found the marriage for Elizabeth Dees and William Barefoot on Ancestry but it was not listed on the Richmond County page. Do you have a copy of this Certificate. I also found a Jon Dees on the 1790 Richmond County Census. Note from Ed Harmon to Luan: You were not part of this discussion, months ago,but Victor looked for over 20 years for Grandma Barefoot, referenced by his grandmother, and never found anything about her. He asked my mother to ask my grandmother about Grandma Barefoot. My Grandmother'sresponse set off the alarmbells and confirmed that there was in fact a Grandma Barefoot. The 5 of us together put together the puzzle that Grandma Barefoot was Elizabeth, mother of Daniel Dees aka Daniel Graham, aka Daniel Barefoot aka Daniel Rodgers. We used the trial information, marriage records and census data. 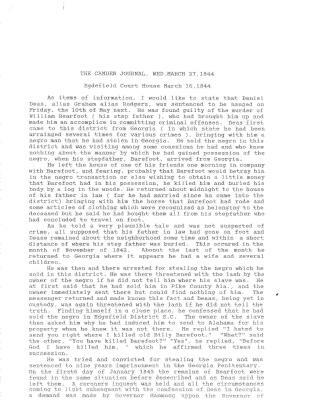 The importance of these three documents is that they confirm, aslegal documents,that Daniel Graham of Pulaski County was the step son of William Barefoot and that it was our Danielwho killed William and it was Daniel's mother, Elizabeth,who is our Grandma Barefoot.The documents also confirm thatthe 1859 GA prison record of aDaniel Graham is for another Daniel not our Great Grandfather. Here's a note from an on line Dees genealogy: Most of the Dees men listed here, died in Pulaski County, Georgia. They are listed in the Early Court Records of Pulaski County, punlished in January 1819. After Daniel Dees Jr died, Elizabeth married William Barefoot in Richmond County, Georgia in October 1813. William was a brigand and preported member of the Murrell Gang. Daniel Jr born after 1774 in North Carolina was the son of Daniel Dees. [S49] 1820 Census;, He is listed at Barfoot. See print out in my file. While researching my husband's genealogy, I discovered your information for Alexander Causey and Right Barlow. Henry (W)right Barlow was my husband's grgrgrandfather, and Alexander Causey was his grgrgrgrandfather. We are interested in sharing information with you. If you are willing to do so, please contact us.